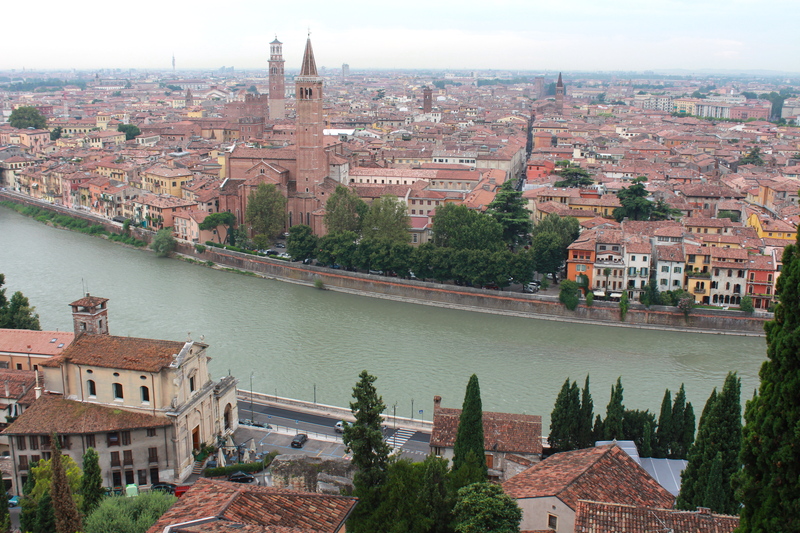 We’re just back from a quick two day trip to Verona. Amazingly enough it was our first time in Verona and we’re kicking ourselves that we didn’t go sooner. It’s a gorgeous city. And less than 2 hours from our home! So many places to visit and so little time I guess. While there we experienced record setting high temperatures (it got up to 43 degrees at some point in the day). We stopped for a lot (and I mean a lot!) of gelatos, granita and popsicles. 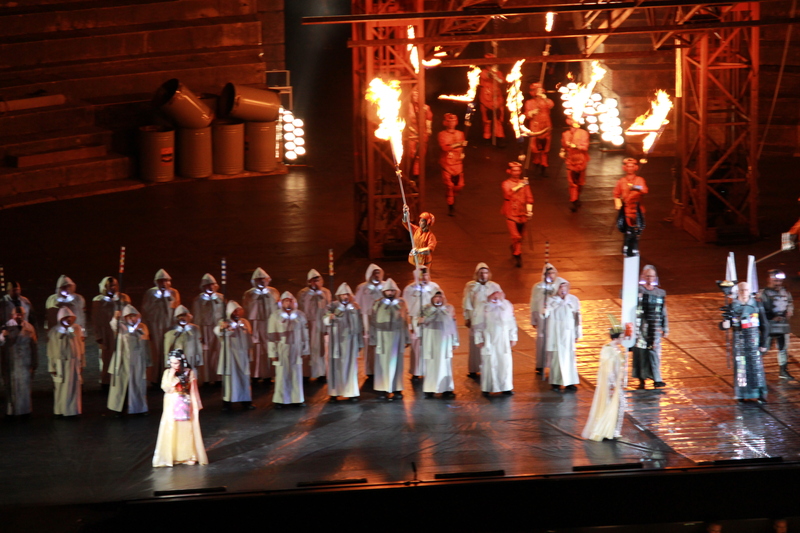 On Sunday evening we went to see the world famous opera Aida at the outdoor Verona Arena which is celebrating it’s 100th anniversary season this year. We actually got to see the new production of Aida and we were quite shocked at how modern it was. I mean, there were acrobats, glow balls and even Segways in it! A tad confusing to tell you the truth. But entertaining just the same. 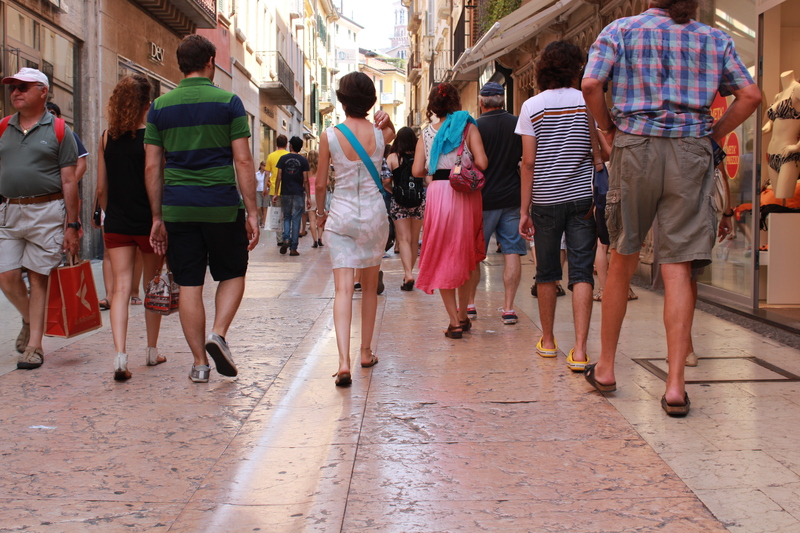 Here are a few images of our time in Verona. I’ll be writing a more in depth post for my Traveling With Kids column on Classic Play soon. The city was packed with hot sweaty tourists. I think the gelaterias made enough money to support themselves through winter. We stopped at a little traditional restaurant for lunch. My son ordered pasta with a donkey ragu sauce and I ordered the local specialty pasta with duck sauce. Very tasty! Outside the arena you can admire all of the opera props. I guess there’s not enough storage inside to store all these gigantic lanterns, statues and fake pyramid stones. 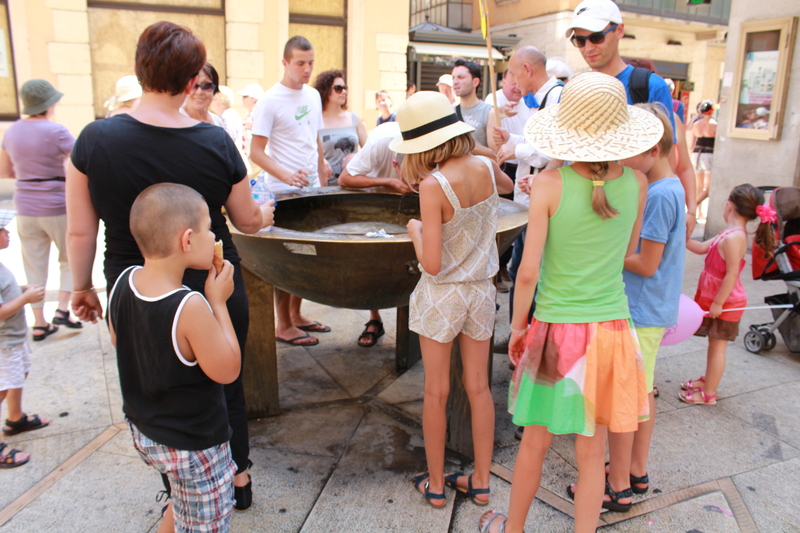 Luckily there are many little water fountains placed around the city. On a hot day like this they were all surrounded by scads of people. 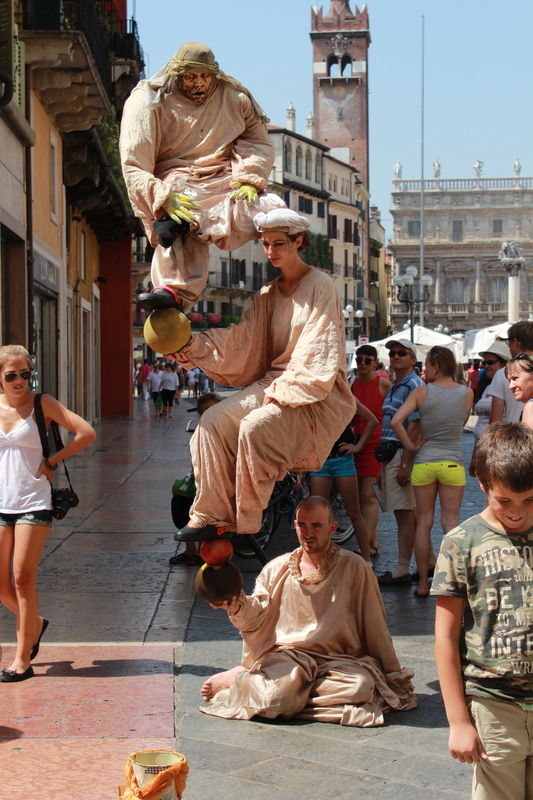 Many many street artists are to be found in Verona. On every corner and piazza there are lots of photo ops to be had with armoured gladiators or cleopatra (especially directly in front of the Arena). And of course you can’t visit Verona without going to see the famous house of Juliette and her iconic balcony. It’s a tiny little courtyard filled with hundreds of people. Not for the claustrophobic! 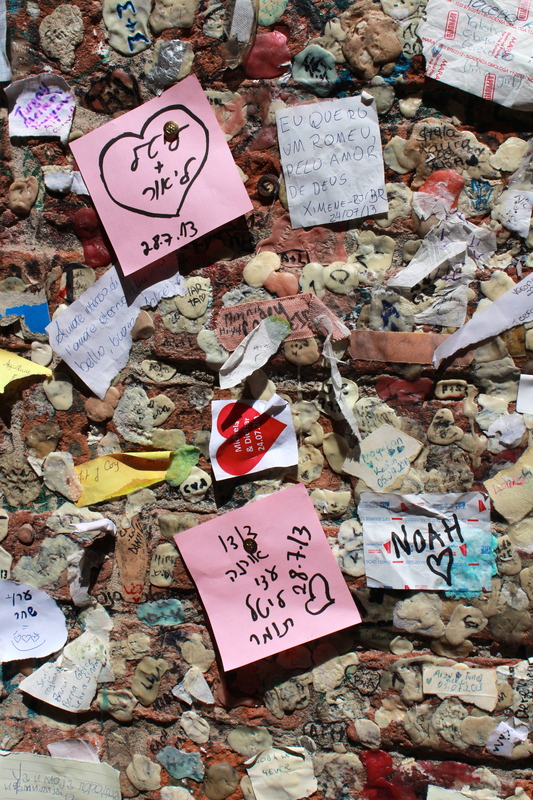 The walls around the courtyard are filled with love notes in every language (and tons of chewed gum…anyone know the significance of that?). 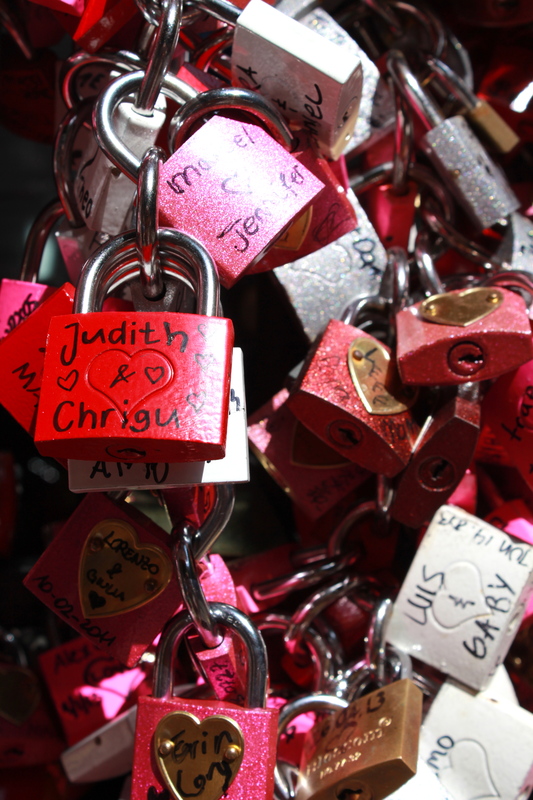 And a wall full of love locks with names and dates (which are apparently for sale in the little gift shop located in the courtyard. Admiring some Roman ruins along the way. Best purchase ever to keep these guys happy and content while walking around in the heat. I think we rested on every bench or stone we came across. Arrived at the Arena at 7:30pm to get good seats (the last row…best seats in the house). It was still hot and sunny and every single person had a fan. It was beautiful to see. Most people bring along some cushions to make the long evening spent on stone benches a tad more comfortable (but I’ll admit that we were all in pain after 5 hours). I swear I didn’t intentionally colour coordinate everyone for our big night out. We were so happy to have that fence behind us instead of thousands of other spectators. We could stand up and lean back (and enjoy the stunning sunset and views over the city). Aida, the new production. The costumes were gorgeous. The singing…very opera-like. Can you guess that I’m not a huge fan of opera? The day after the opera. After only a few hours sleep the kids hung around like this all day. Or almost fell asleep while I took photos. Despite the fatigue we managed to climb up to this castle to get a nice view of the city. We were so happy to see those clouds and feel the beginning of a big rain storm. Can’t wait to go back and explore some more! I loved Verona and I love your 2nd to last shot! It really is a gorgeous city. Can’t wait to go back soon! 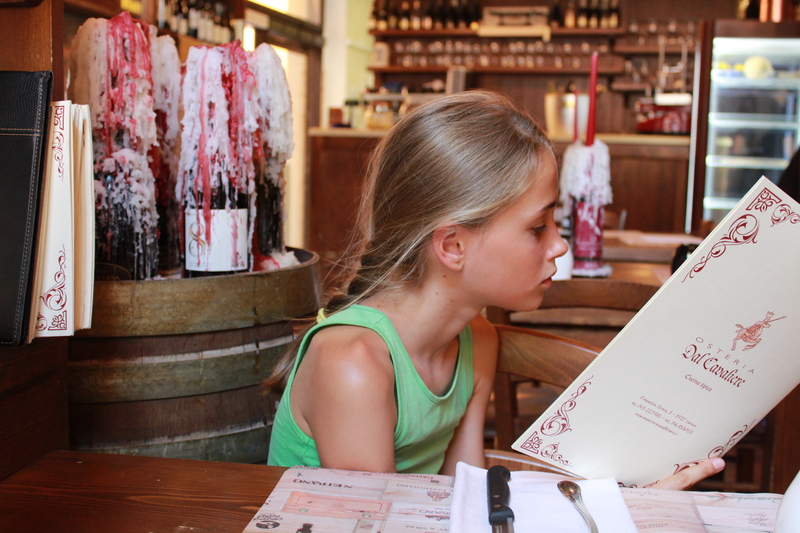 Beautiful photos – I look forward to reading more on your Traveling with Kids post. 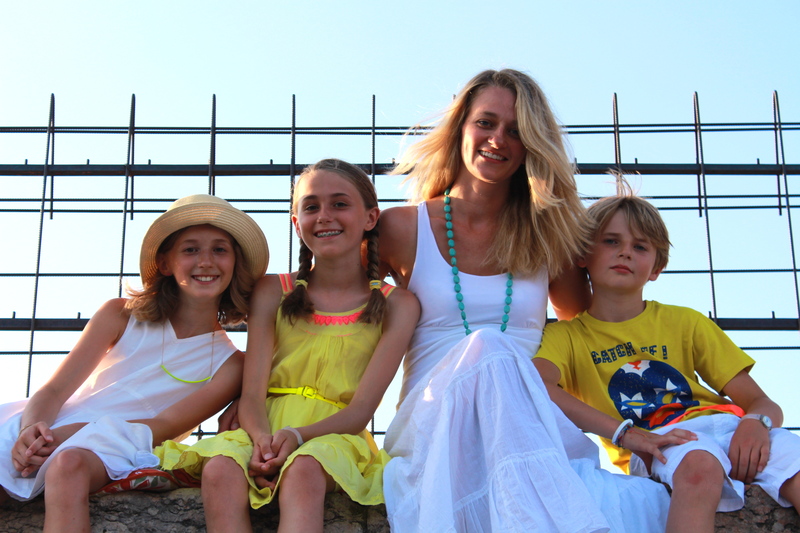 Love the photo of you and your kids – stunning! 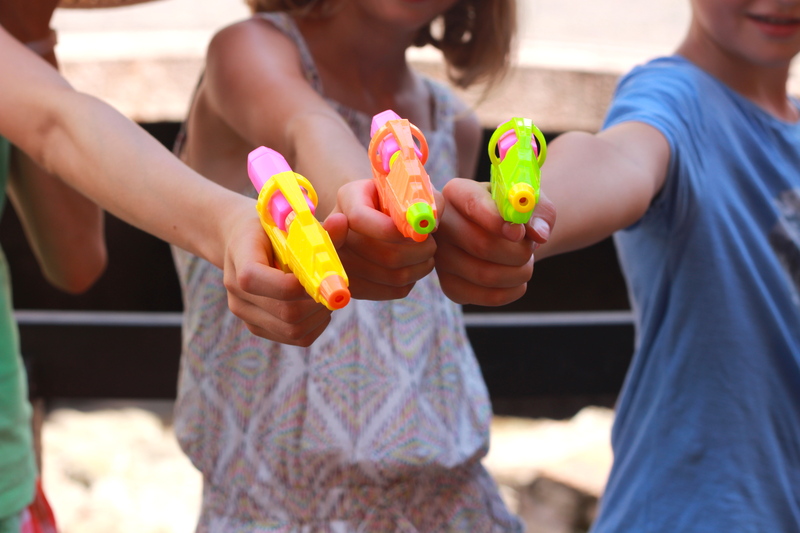 Yes, squirt guns looked like a necessity with that heat! Take care – thanks for sharing. It was HOT. Even I appreciated those water pistols! What your mama said. I would love to go there……in the autumn. Loved seeing that photo of you and the kids, and i even spotted tom in one of your photos. What a wonderful visit to Verona! It looks hot! But everything is better with gelato. yummm. And I really love all your outfits (color coordinated or not) they are so colorful & classy! I made sure that we all got a little bit dressed up for the opera. There are so few occasions in life to get dressed up nowadays! I was quite shocked that there were people at the opera wearing sweatpants and crocs (and I even saw one lady wearing just a bikini top!). I can imagine it must have been freezing in Feb. You should really try and go in the summer sometime and go see the opera. It’s really an amazing experience. And I think you might be right about the gum. Kind of icky though! Looks amazing! I went last summer and saw Aida too! 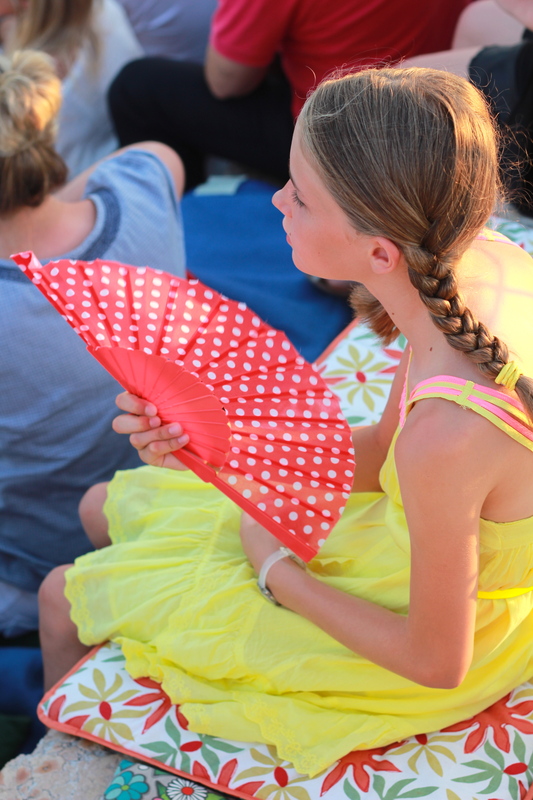 It was boiling hot and purchasing a fan was a must….I still have it as a souvenir. Also got little candles to light too when it went dark. Lovely story and the set was spectacular. 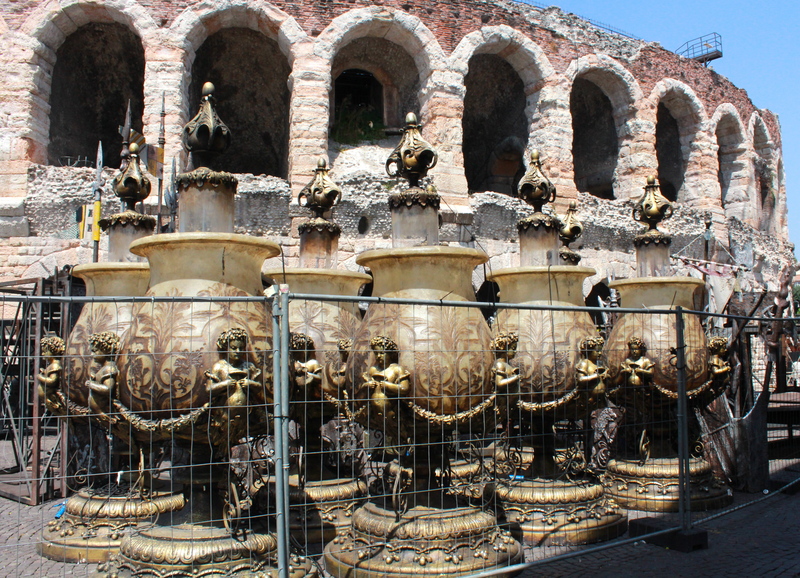 Not my favourite opera but just simply stunning to see it in Verona. Great post! Lovely photos. I just learned about your blog from A Cup of Jo. Wonderful!! 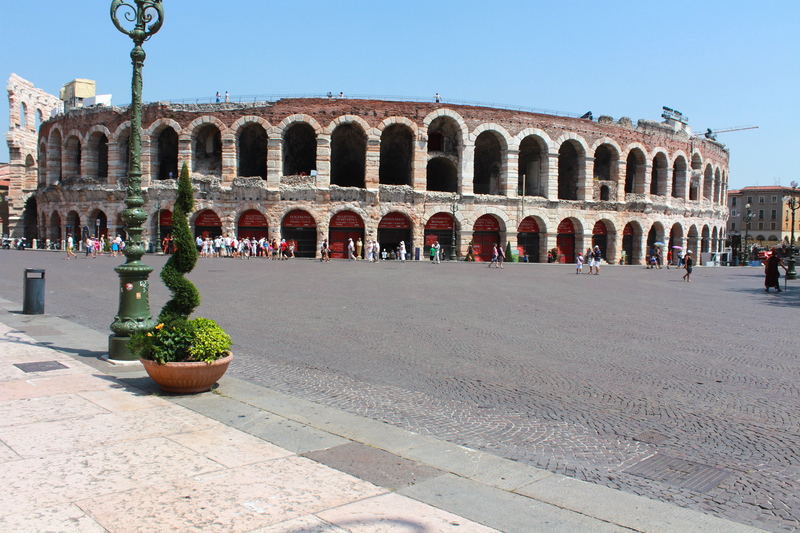 Love this post on Verona! So exciting to see how a family lives in Italy. What fun! Thank you for sharing!